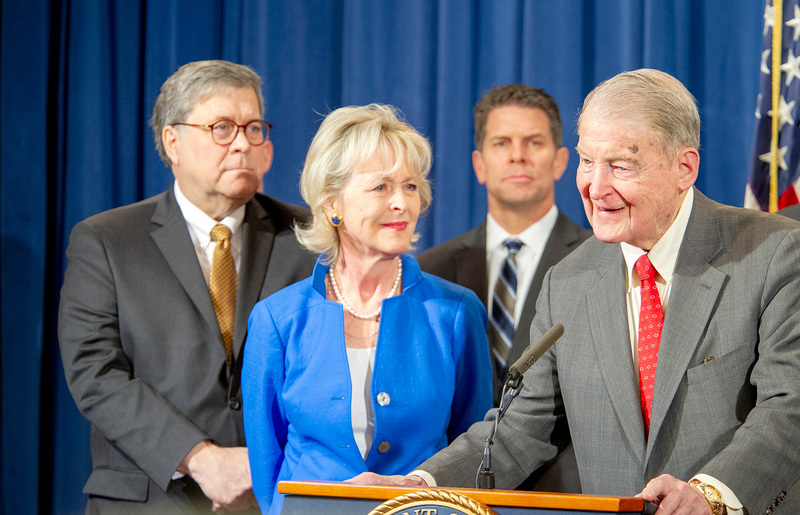 Former FBI Director William Webster—pictured with his wife, Lynda—speaks during elder fraud press conference at the Department of Justice. The Websters were targets of a fraud scheme in 2014 and helped the FBI capture the subject. Also appearing at the press conference were Attorney General William P. Barr (left) and FBI Deputy Director David Bowdich. What the caller, Keniel Thomas, 29, of Jamaica, missed was possibly the most salient detail about his intended victim, who was 90 years old the time: William Webster had served as director of both the FBI and the CIA, and so had a pretty good radar for pernicious criminal schemes — in this case, a Jamaican lottery scam. “I get complaints all the time,” said Special Agent John Gardner, who was assigned to the case and has been investigating these types of crimes since 2011. He said the perpetrators frequently prey on older people because they tend to be more trusting, financially secure, and lonely. The fraudsters buy and trade “lead lists” on the Internet with senior citizens’ names, phone numbers, and other personal information. Then they start calling, hoping to reach receptive unwary ears. Lynda Webster, 63, said she and her husband frequently get suspicious calls, likely because of their demographic. Gardner said sweepstakes or lottery winners do not have to pay fees or taxes to claim a prize. “If it looks too good to be true, it’s probably a scam,” he said. William Webster said the entire experience — getting calls, working with the FBI, and seeing his tormentor in court last month — is a reminder that seniors and the trusted friends and family who look after them need to be vigilant.